Warning! This is a harsh review and I may burst a blood vessel as a result, sorry for the mess if I do. The squeamish can leave now. Otherwise, here goes. I am, quite often, sent review copies of song soundtracks, usually just recycled from elsewhere and in those instance there is zero point in me writing a review as my comments on a collection of disparate songs are almost entirely redundant and not of interest to you, the loyal readers of Soundtrack Express. However, I am willing to give CDs a spin if they contain some songs and some score. 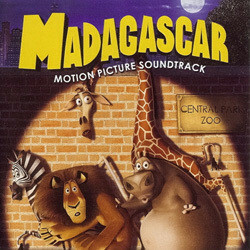 In the case of Madagascar I took the view that it looked to be an even split between songs and score, plus it looked like a fun film that could have a fun score. 50/50 tracks, yes, 50/50 playing time, big fat no. Of an already miserly playing time of 31 and a bit minutes, about 10 are score (1 minute and 24 seconds of which is from Born Free by John Barry and 'arranged' by Hans Zimmer... there's not something you see every day) and the rest songs. Even the charitable would agree that the existing music choices are pretty feeble and I would guess that most function in the film as some kind of parody - it's certainly easy to see how Hawaii Five-O, Chariots of Fire and Stayin' Alive might be used to such an end, but they really don't need to be on the soundtrack album. I mean, who is really hankering after such a combination, together with a bit of Earth, Wind & Fire, Sacha Baron Cohen (he of Ali G fame, a one joke character if ever there was and not a very funny joke at that) and the millionth use of Louis Armstrong doing What a Wonderful World in a film? The film music fan might be tempted to pick it up on the off chance that Zimmer's handful of tracks are all a few minutes long and there's a nice 20 minute suite, but Zoosters Breakout to Beacon of Liberty constitutes less than 6 minutes of music. Zoosters Breakout sounds like it could be good if it went somewhere, but it doesn't and the best tune is, unsurprisingly, Born Free. There are a couple of minutes of score that are just about worth hearing. Whacked Out Conspiracy by James Dooley (one of Zimmer's 'and chums') is funky, big band, jazziness and the opening Best Friends, unsurprisingly composed about 47 people (actually Hans, Heitor Pereira, Ryeland Allison and James S Levine - not the conductor), is a nice whistle along anthem that has one of those tunes that should feature accompany a milk man being followed by a large group of people who have slowly gathered behind him in an advert for whole grain bread. Or something. I'm sure, somewhere in there, Madagascar could be a fun score, but the album makes a seriously poor case for Zimmer and chums' music, there's simply not enough to ever find out if it could get good. Then again, the samples here likely represent the best tracks. Oh dear. From the sublime heights of Prince of Egypt, Zimmer's animation scoring has got lazy and boring, in fact, his composing in general as gone that way. A composer who needs to spread himself less thinly and pick projects with far more care. Hans passed up Kingdom of Heaven for this? Craziness. A dire release of a below mediocre score. Pick up George Fenton's Valiant or John Powell's Robots instead, both are brimming with imagination and melodies, vastly better than crap like this which really gives film scoring a bad name. Next. Ps. Having being sent from the US, my copy contains one of those ridiculous FBI anti-piracy warnings which are gross, utterly pointless and will make NO difference to people who want to swap songs online. Please stop. Land of the free, unless they want to frighten you into not doing something, what a dreadful approach. Not that I can imagine there's anyone who would want to copy Madagascar although I bet there are people who might have paid money for it and wish they hadn't. I need a lie down.